September 9, 2014 by Ecommerce News. About Cross-border, Online store with tags Austria, Belgium, Denmark, France, Germany, Ireland, Poland, Sweden, The Netherlands, The United Kingdom. 5244 views. Wrangler has some big plans for this fall: it will launch an online store in ten European countries as well as launch a campaign with Finnish racing driver Kimi Raikkönen to boost sales. At the end of this year, Wrangler’s online has to available in Germany, Sweden, Denmark, Austria, Poland, the Netherlands, Great Britain and Ireland. France and Belgium will follow later. 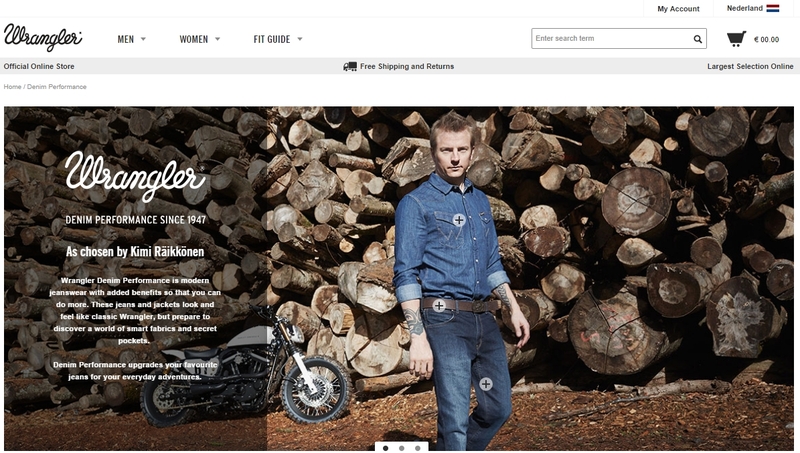 The American jeans manufacturer thinks the new website is their “first and best way to talk about the brand Wrangler“. For both the brand and the product it’s a great platform to convey information. Our new website will enhance not only our sales directly, but also sales in our own stores, in partner stores and at wholesalers throughout Europe”, Frans van Zeeland, president of Wrangler EMEA, says on W & V.
A tweet from @Wrangler_Europe on August 6. More about Austria, Belgium, Denmark, France, Germany, Ireland, Poland, Sweden, The Netherlands or The United Kingdom.